Troop 1, as the county's first Boy Scout Troop, holds the honor of beginning the Scout Movement in Japan. 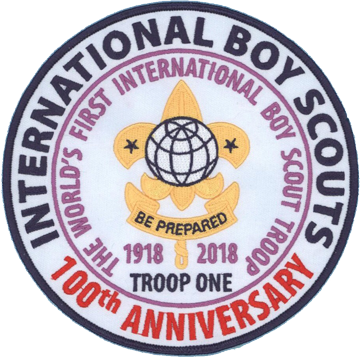 Formed in 1911, just months after B-P's Scout Association was established in London, and registered with the Imperial HQ of The Scout Association as "British Scouts in Foreign Countries" the Troop had a decidedly "International" character from the beginning. 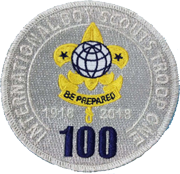 However the "International" character of the Troop was actually in conflict with the rules of the time and, after consultations with B-P, Troop 1 dropped it's British charter in 1918 in favor of allowing Scouts of any nationality to officially join the Troop and the Boy Scout Movement. 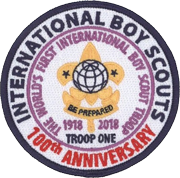 With the establishment if the BSIB (today's WOSM World Scout Bureau) B-P issued Troop 1 a direct Charter with the newly formed Boy Scouts International Bureau (World Scout Bureau) creating the world's first directly registered "International" Troop. 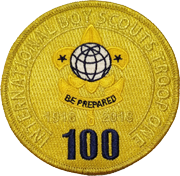 The first meeting of Troop 1 as an "International" Troop was on September 15, 1918. 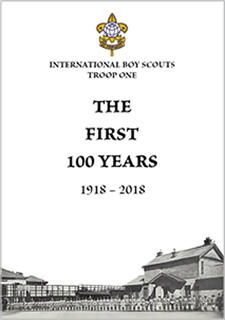 This year the IBS celebrates 100 years of uninterrupted Scouting, having continued through even the difficult times of disaster and war, and bringing Scouting to youth of more than 40 nationalities over the years. 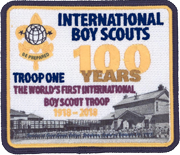 We believe that Scouting, and especially "International" Scouting is as important, maybe even more important, now than it was 100 years ago and again wish to thank everyone for the generous support that has allowed the IBS to continue it's service for the past 100 years and, hopefully, for the next 100 as well! For those living overseas donations can also be accepted through PayPal or by personal checks in US$ drawn on a U.S. bank. for details or with any questions that you may have. with details of your donation, an email address to receive a confirmation, your current mailing address to send the appropriate anniversary patches etc donation level, and your name in English.